A Literary Odyssey: Book 47: Finished. So I tried to read this w/ my mom when I was maybe 9 and we ended up abandoning it from boredom (something we never did with any of the other classics!). I suppose one of these days I should give it another try (especially since I've been reading more 18th cent lit this year), but it still makes me shudder. I'll keep your post in mind though! This is one of those books to be read again and again. You might also enjoy J.M. 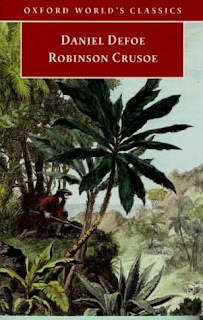 Coetzee's variation on Crusoe--it's called Foe. Like you, I did stay away from this book. But your review changed that and I know I want to read it sometime. I just have to figure out when.. I have so many books that I need to read. I read this as a young'un, maybe more than once. The edition I read was missing big chunks of the book. It basically dumped Crusoe right onto the island, and ended when he left it. All for the best, since the beginning and end of the novel are terrible. The juvenile edition also cut out most of the religious content, which is substantial. This book must be among the three or four most idea-rich novels in history, and all from such a simple premise.